You are here: Home / Free / East Liberty History & Upcoming Lectures on George Washington & Frederick Scheibler, Jr.
East Liberty History & Upcoming Lectures on George Washington & Frederick Scheibler, Jr. The East Liberty Valley Historic Society is a nonprofit that exists to document and share the history of the East Liberty neighborhood and surrounding areas. East Liberty is a particularly interesting area of Pittsburgh when it comes to development as it has many buildings from the time East Liberty became a fashionable suburb for some of Pittsburgh’s wealthiest families who were looking to escape the congestion of Downtown Pittsburgh in the 1850s. East Liberty is also the site of a massive Urban Renewal project in the 1950s. The East Liberty Valley Historic Society has been documenting and sharing information about the neighborhood from both of these eras and everything in between. 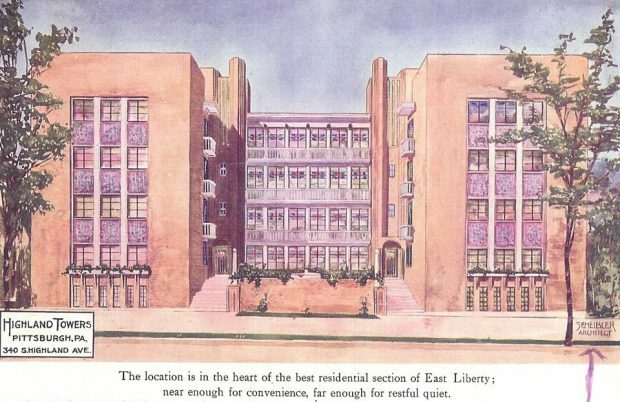 You can read a detailed history of East Liberty from the 1700s to today, on the East Liberty Valley Historic Society website here. Follow East Liberty Valley Historic Society on Facebook for more photos and history of East Liberty. There are two more lectures in the East Liberty Valley Historic Society Spring Lecture series that may be of interest to Pittsburghers looking to learn more about history and local architecture. Presented by Miles S. Richards, Ph.D., author and retired Faculty Member, University of South Carolina and Midlands Technical College. Apartment building on Highland Ave designed by Frederick Scheibler. Presented by Martin Aurand, Author and Principal Architecture Library/Archivist, Head of University Libraries Arts Library and Special Collections Department, Carnegie Mellon University. Looking for more historic preservation events? Join the Pittsburgh Historic Preservation MeetUp group.